We’re heading to Boston tomorrow for PAX East! Last year’s crowd at PAX East was fantastic! We’ll be on two panels this year. Our first will be on Thursday at 6:30, titled “Collaborative Homebrew 101: Cure for the Common Murder Hobo.” We’ll be relaunching the panel we offered at PAX South earlier this year, where we collaboratively created a map and adventure hooks with the audience. It was great fun! Read the description here. The second panel we will be on is called “Clinical Roll: When a Bunch of Geeky Therapists Play D&D,” and will feature other practitioners who use D&D with their clients. Read the description here. If you’ll be there, send us a message on Twitter and make sure to come say hi! 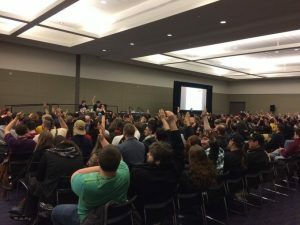 If you missed us at PAX East last year, back when we were presenting with Wheelhouse Workshop, the audio from our panel was recorded and can be heard via the Geek Therapy Podcast.